We make FULL valuations affordable so that you can set the Right Price to buy or sell. A valuation documents the transaction and protects your investment. If you like the home, insist on X-Listing Price™. It's computer-backed. It's valuer-backed. It's a price buyer, seller, renter, and agents can ALL AGREE on. Deal done! 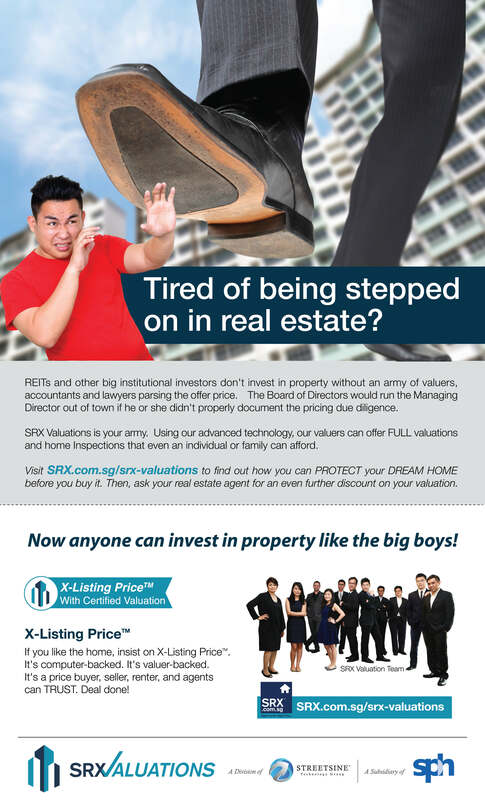 Contact your SRX agent for a further discount on your valuation. FAQ #1: Why are our full valuations fast? Automated scheduling software. V-8's scheduling software optimizes field inspections by location, time slots, and availability of valuers and field officers. As such, our current manpower allows us to do over 100 field inspections per day. Instantaneous collection and auto-population of SRX Field App. 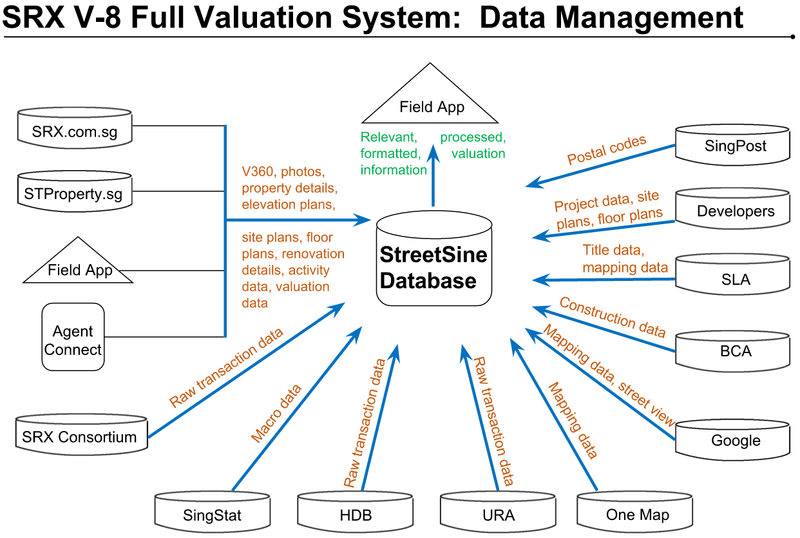 StreetSine's database is integrated with over 30 data sources. As such, we have the most comprehensive database of transaction data, property details, site maps, floor plans, area maps, and construction detail waiting to be auto-populated into a new job order in our Field App. Our valuers and field officers aren't shuffling papers. Everything is paperless. Algorithm-aided valuation analysis. 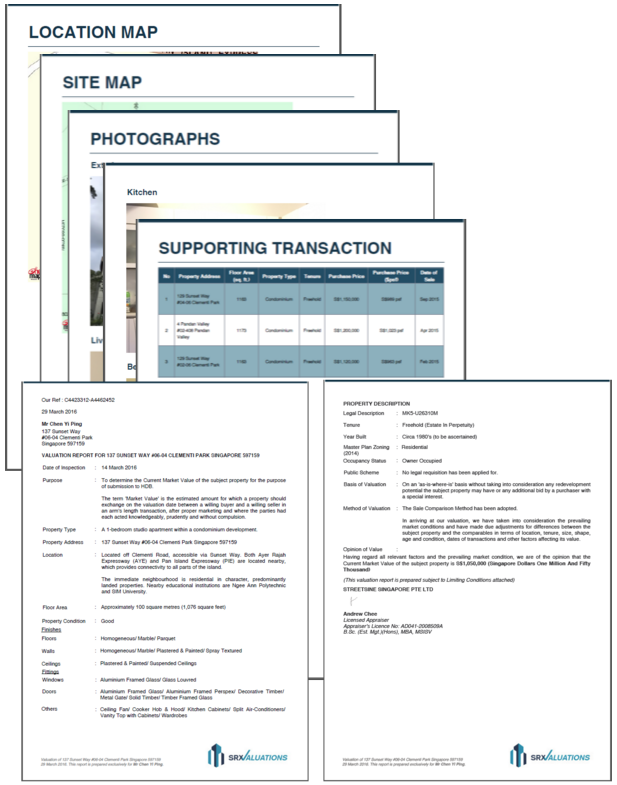 Our valuers don't have to waste their valuable time collecting and organizing information. Our Field app algorithms give our valuers everything they need to analyse a property in the most efficient format to conduct sophisticated - but standardized - human analysis. Field app standardized inspections. Our field app guides our valuers and field officers through a comprehensive and standardized field inspection process. Our inspection checklists ensure that every inspection is consistent and rigorous and best-in-class. Centralized review process. Our Chief Valuer has his pulse on everything via the V-8 management console. He monitors turnaround time, inspection quality, and analysis. He reviews every report to ensure best-in-class. One day SLA. The SLA clock starts from the close of the inspection, not the order. 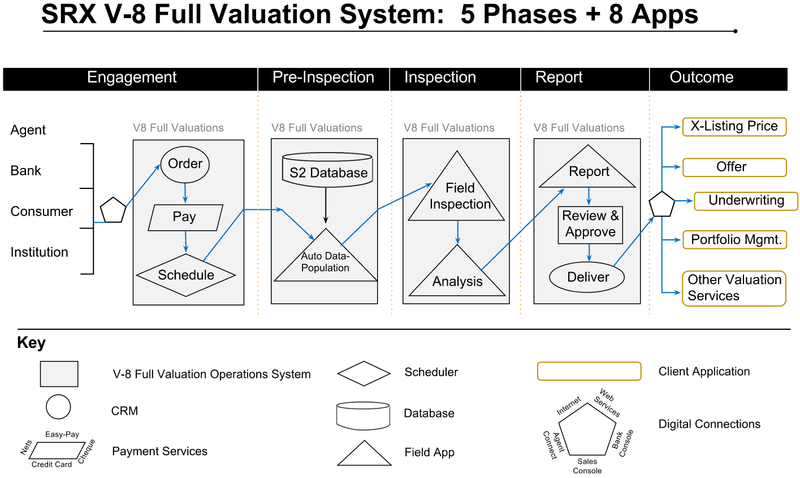 As 5 Phases + 8 Apps diagram illustrates, most of the work is done prior to the inspection That allows us to finalize, review, approve, and distribute the full valuation report within one working day of the inspection. If there is something amiss with the valuation, of course our Chief Valuer will not approve the report and will work with the client to rectify the problem. We won't reduce the integrity of the report for the sake of the SLA but we will design and maintain our V-8 system to execute normal full valuations within one day of the inspection. FAQ #2: How do we integrate big data, tech, and human expertise? We use Big Data to provide our valuers with the most comprehensive and instantaneous information available. For more information on the integrity and speed of our data collection, processing, and dissemination, please read our white papers: Framework for an Efficient Property Market (EPM) and SRX Property Price Index. It is impossible for a human valuer to collect data from over 30 sources, process, and put the information into a useable form. Using computers to perform these mundane tasks is a no-brainer. Not to take advantage of technologies like video, photo, and checklist capabilities, which are readily available on customized valuation apps for tablets and smart phones, would impede productivity, efficiency, and transparency. Finally, failing to pre-populate Valuer App with information and supporting documents prior to field inspections would be inefficient and unproductive. Technology does not replace human judgment. Indeed, technology enhances human analytic capabilities. Since our valuers do not have to waste their time with mundane tasks like data collection and organization, they can focus on value-added analytics and services and still meet their SLA requirements. FAQ #3: How do we ensure the highest standards? Controlling the inputs into valuations. Our systems ensure the integrity of the collection and processing of information that is used by our valuers in their full valuations. 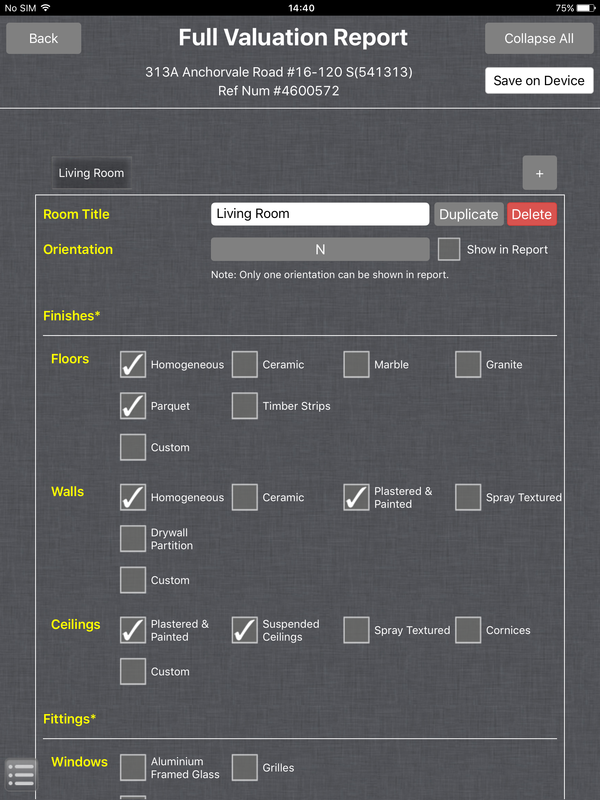 Field App (pictured at right) consists of a series of checklists that ensure that every valuation is conducted in the same systematic way every time. The system accounts and documents any exception or deviation from standard operating procedures. Our Chief Valuer monitors and reviews our valuation team and processes. Not only can he see everything going on, the computer will prompt him with alerts to ensure the smooth running of our operations. Complete transparency. We document everything. We are no black box. FAQ #4: How does V-8 reduce risk in real estate? Transparency, documentation, and responsibility reduce risk in real estate. 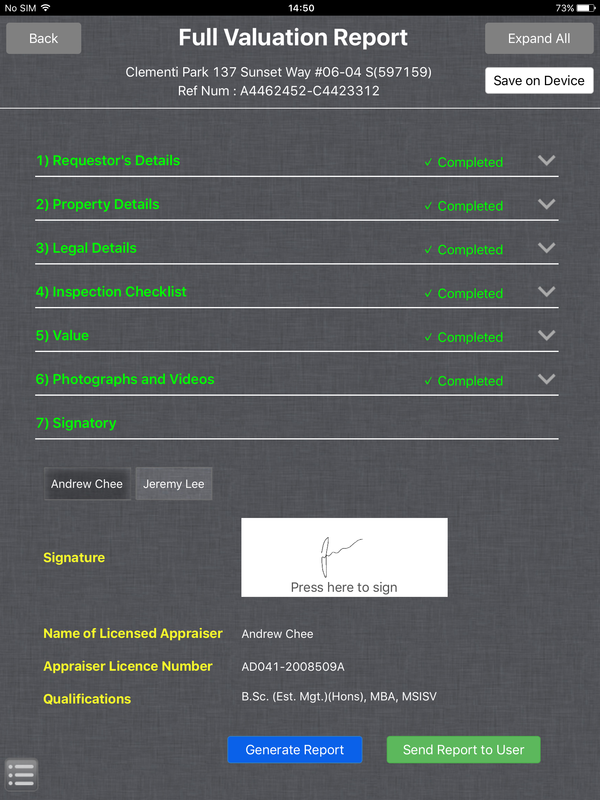 Not only does our Chief Valuer sign the valuation report and take responsibility, but, in future versions of Field App, property owners and clients will sign off on applicable information. FAQ #5: Why can we charge clients less? Simple. Economies-of-scale. We can do more valuations a day than conventional valuation firms because we support our valuers with the best information and technology available in the world. What does this mean to our clients? We can pass the savings of economies-of-scale onto them. More importantly, we can serve an entire new market of clients who, heretofore, could not afford to engage expert valuers to protect them when buying or selling property. The contents hereof are correct as at the date of publication. Notwithstanding the foregoing, SRX Valuations and the Streetsine Technology Group reserve the right to change its processes at any time without further notification.